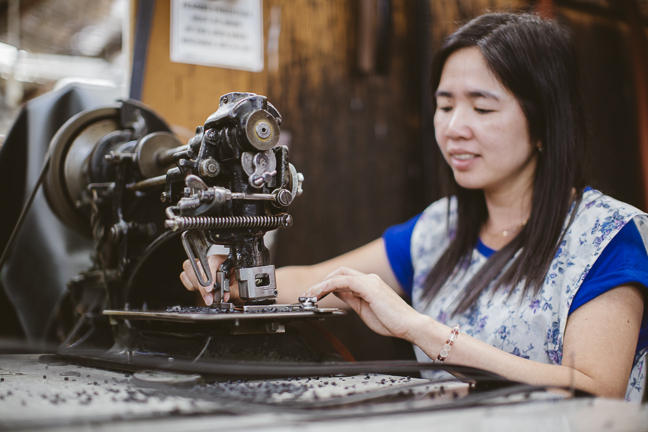 Discover the process and meet the people who handcrafted your Australian made accessory. Maria has been with Buckle | 1922 for 22 years and is an essential part of the initial stages of belt production. When leather hide arrive, it must be cut into smaller, more manageable pieces. 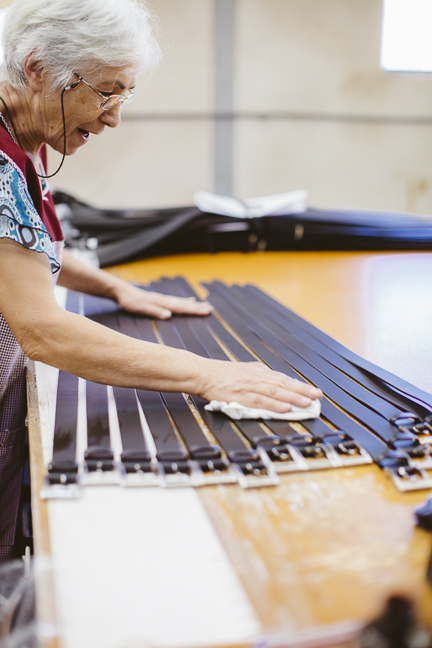 Here you can see Maria carefully feeding a piece of raw leather hide through a cutting machine, creating long thin strips that will form the basis of a more detailed belt. Lee has been working for Buckle | 1922 for more than 18 years. Here she is operating the glue line. This is where the backing is attached to the top leather of a belt and requires special attention to ensure both sides marry up perfectly. Here you can see Lee lining up the leather and backing, carefully guiding them through the glue machine. Lee also assists with the cutting and preparation of leather, which is the first step in the belt making process. Jackie-Lee has been a part of Buckle | 1922 team for more than 10 years and is involved in many of the steps that are required to create a belt, all the way from invoicing to shipping. Depending on the belt being crafted the leather must undergo different processes to produce the final product, and here you can see one of those steps as Jackie-Lee trims the edges of a belt in a process known as skiving. Multi-talented, Jackie-Lee also is responsible for invoicing and loads all shipments making sure everything is packed safely on outgoing trucks. Jack is quite literally our Jack of all trades! With 21 years’ experience in our factory he assists wherever help is required, from unloading shipments and machine maintenance to skilfully cutting leather and finishing belts. Here Jack is shown sitting at the large Minor press carefully sliding a belt through and punching prong and buckle slots. Over her 15 years working for Buckle | 1922, Connie has mastered a time-honoured technique used to apply colour to the edges of a belt. She is pictured here using a sponge to delicately apply black colouring to a belt which has been bevelled down. This is one of few processes that has not changed since the establishment of the brand. Goreti has 18 years’ experience working for Buckle | 1922 making her very skilled at operating our stamping machine. The machine requires a high level of hand and foot coordination which should not be underestimated! A belt isn’t complete without a buckle, and that’s exactly where Becky and Ping shine. They have more than 30 years combined experience and specialise in sewing the buckles onto the leather strap – a process which we call ‘bartacking’. Becky (left) and Ping (right), complete the process by attaching a swing ticket to the belt. Lily has been working for Buckle | 1922 for more than 12 years and in these photos she is shown crafting our porthole belts. This machine, which has been engineered to stamp a ‘porthole’ pattern into our belts, is more than 100 years old and has recently been ‘put into retirement’. The machine has been cleaned up and now takes pride of place in our head office. 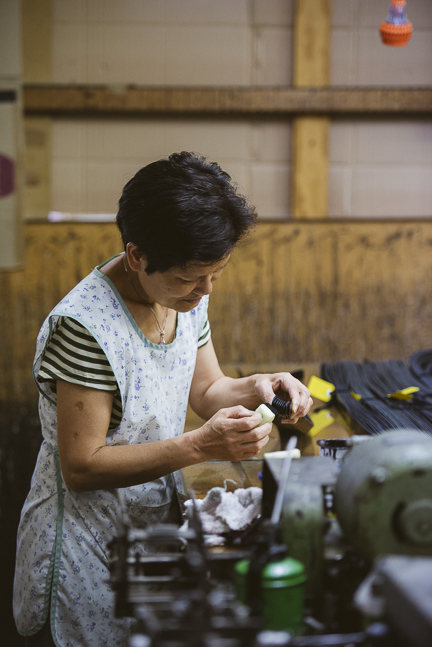 Lily is considered an all-rounder and normally works within our assembly area, which involves attaching buckles to belts. She has also worked in picking and braces departments. With more than 30 years combined experience, Linh and Noot know the factory like the back of their hands. They know exactly where to find a product amongst our rows upon rows of shelves and as such are our amazingly fast order pickers, processing huge quantities of orders every day. Noot (left) and Linh (right) are shown picking stock service belts, bundling and preparing them to be shipped out. Noot also is the person responsible for handcrafting our braces. Leonor is our longest standing employee, being with the company for more than 44 years! She is extremely dedicated and strives to ensure all belts are in superb condition when they are dispatched. Here you can see Leonor cleaning the belts before she double checks and packs the order.